Andover, MA – In a major exhibition at the 2014 Radiological Society of North America Annual Meeting (RSNA), Royal Philips (NYSE: PHG, AEX: PHIA) today revealed a full range of radiology solutions. Visitors to the Philips booth (#6742) will experience Philips’ breadth of diagnostic imaging, informatics and image-guided therapy solutions designed to increase clinical performance while creating a superior patient experience and driving cost-effective and high-quality care for health systems. One of the leading global conferences on radiology care, RSNA 2014 will showcase the industry’s most promising research and leading innovations. At 12 noon CT on November 30th, Royal Philips CEO Frans van Houten will officially open the Philips booth, highlighting radiology’s role in driving the future of health technology, and introducing the launch of two new solutions in the area of dose management and informatics. Vereos PET/CT – World’s first and only true digital PET/CT offers approximately twice the volumetric resolution, sensitivity gain and quantitative accuracy compared to analog systems. IQon Spectral CT – Industry-first CT that adds spectral resolution to the image quality, delivering both anatomical information and the ability to characterize structures based on material content. EPIQ Ultrasound – Philips’ most powerful architecture ever applied to ultrasound imaging delivers more clinical information, with highly detailed images, extraordinary temporal resolution and superb tissue uniformity, even on technically challenging patients. Affiniti Ultrasound*– Innovative ultrasound system designed to help radiology departments deliver high quality patient care while facing increased patient loads with fewer resources. IntelliSpace PACS – Expedites results to referring physicians and enables efficient collaboration with other clinicians to make more informed decisions and improve patient care. Oncology Dashboard – Disease follow-up data is captured in a single, patient-centric overview to facilitate communication and next steps between oncologists and radiologists. 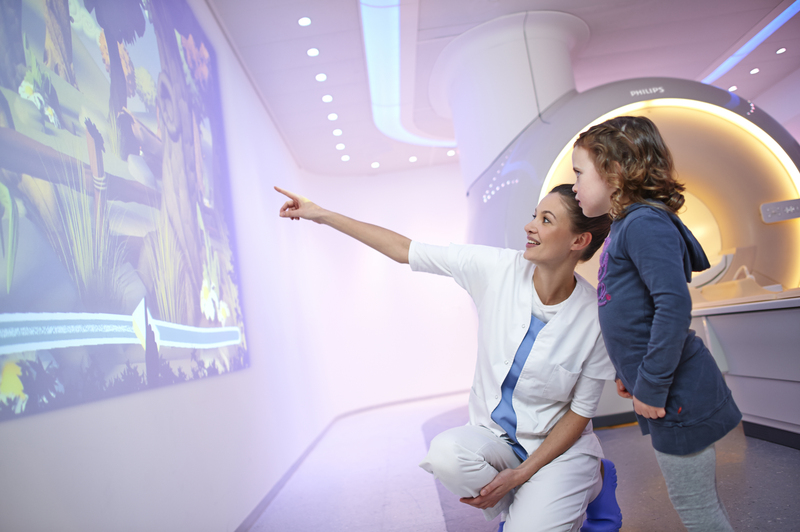 Ingenia 1.5T S with Ambient MR In-Bore – Offers a soothing audiovisual experience to relax patients while inside an MRI scanner. MicroDose SI – Comfortable and less stressful mammography experience maintains outstanding image quality using non-invasive spectral applications. AlluraClarity Interventional Suites – Industry-leading interventional X-ray systems to guide minimally invasive procedures offering high image quality at a low X-ray dose for neurology, oncology and cardiology. Diagnostic X-Ray Suite – DuraDiagnost, DigitalDiagnost, MobileDiagnost and ProGrade comprise a suite of flexible digital radiography solutions designed to enhance access to care. Veradius Unity Mobile C-Arm – Improves workflow and throughput by establishing exceptional communication between the physician, operator and C-arm. IntelliSpace Portal – Integrating data from multiple imaging systems to give clinicians a more comprehensive view of every patient. Philips and its physician partners will be hosting a Lunch n’ Learn symposium on Wednesday, December 3rd at 12:30 p.m. to discuss photon counting technology for mammography, spectral breast density measurement, and spectral lesion characterization (South Hall, Room 403A), and participating in additional presentations throughout the meeting. Topics include techniques for interventional sonography and thermal ablation, interventional breast procedures, evaluation of coronary stents with coronary CT angiography, musculoskeletal ultrasound, and fast and robust MR-related vascular, cardiac, spine and brain imaging. Philips will showcase its radiology solutions in booth #6742 at the Radiological Society of North America Annual Meeting (RSNA), November 30th through December 5th in Chicago, Ill. Visit www.philips.com/rsna or www.philips.com/healthcare and follow @PhilipsHealth for more information on Philips’ presence at #RSNA14. * Affiniti received its CE Mark on September 9, 2014. Affiniti is available for sale in Europe and Asia, with the U.S. launch slated for 2015.